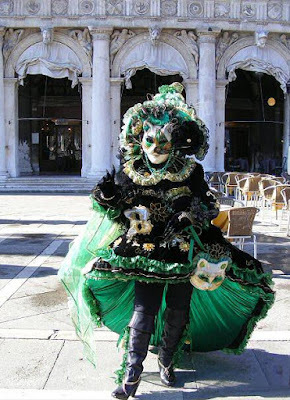 What events are there at the Venice Carnival? There are many events during the Venice carnival season. Some are for people in costume, some are for those not in costume, and some are mixed. For some of them, you'll need to buy tickets in advance to avoid disappointment. There are competitions and parades on the main stage in St Mark's Square, and many of these are open to anyone in costume. However, you need to register in advance on the official web site if you want to compete. There is a seating area for spectators, with tickets available at the entrance. There is also limited standing space outside the arena if you want a quick taste of what's going on. Some of the cafes and bars in St Marks Square hold regular drinks receptions. Perhaps the most well-known are the "hot chocolate in costume" and "cocktails in costume" ones at various venues. Some of these include a traditional dance lesson. When we checked prices, they started at about €60 for the drinks, and €100 for drinks and dancing. Booking sites like Viator* allow you to narrow down your options by date and budget, read reviews, and look at non-costumed experiences too. The oldest and easiest event at the carnival is passegiatta - the Italian tradition of walking at a relaxed pace, with no fixed destination. At carnival time, it's very popular in the arcades around St Mark's Square and on the streets going from there to the Rialto bridge. Just wander around slowly in your costume. We find that it's easy to spend half a day doing this, because even just walking around St Marks Square there are different costumed characters each time around, and there are always other visitors who want to interact and take photos. The best part is that passegiatta is completely free of charge and anyone can take part - just turn up and join in. If you're a bit nervous about walking through an unfamiliar city whilst in costume, you can book an organised package such as a walk and photo shoot in costume* which includes your costume fitting. Sadly though, these aren't always available during carnival season because of the high demand for costumes. The most elegant events at the Venice Carnival are usually the masked balls. These take place in various hotels and Venetian palaces and last for a whole evening. There is usually one official carnival ball that includes cocktails, dinner and entertainment until the early hours of the morning, and it takes place most days. There are similar balls organised by hotels and events companies, some of which are reportedly very good and might offer something different - but facilities and quality can vary. It might be wise to check if your chosen ball is listed in the official carnival events guide, and search online to see if it was run in previous years. Booking sites like Viator* often have reviews from previous carnival-goers. Carnival balls are usually priced as once-in-a-lifetime events. When we checked prices for the official carnival ball in 2019 (which includes cocktails, dinner and entertainment), tickets were priced at €500 each when bought through the official ticket agent. Don't forget that you'll need a costume as well. 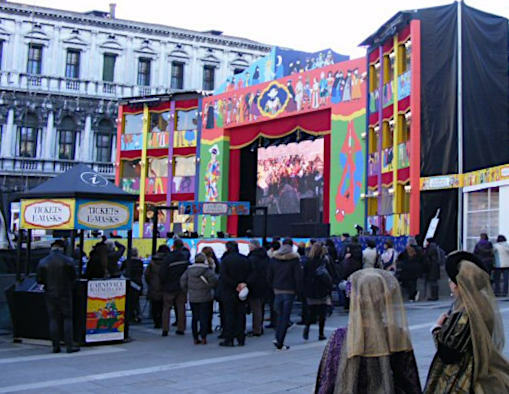 There are many other events in Venice city during carnival time. You can get full information from the official Venice carnival web site, which has an events guide that you can download. Check the descriptions to see if it's a costumed event, as not all are. You can book event tickets through the official web site, or through independent ticket agents. Booking direct means that you're always paying the official ticket price and dealing with the carnival organisers in Italy, which some people find reassuring. Alternatively, independent ticket agents can allow you to buy everything in one place; not just carnival events, but other tickets like gondola trips and occasionally package deals (such as event tickets and costume hire combined). Booking sites like Viator* allow you to see what different suppliers offer, and apply filters by date and price. You should check event descriptions to see if the audience is expected to be in costume (don't assume based on the photos).